Cunard's R.M.S. 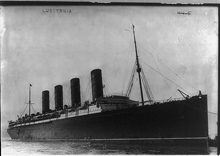 Lusitania coming into port, possibly in New York. The passenger liner was sunk by a German U-Boat early in World War I, on May 7, 1915. At the time, she was carrying 1,959 passengers and crew, 1,198 of whom were killed. She sank within 18 minutes of being struck. Her sinking was viewed by many as what we now call a war crime, and it led to the entry of the United States into the war. During the investigation that followed, investigators encountered many of the obstacles to truth-finding that are listed here. The question of the number of torpedoes provides an example of fabrication. One torpedo was deployed, but since two torpedoes would deflect responsibility for loss of life away from Cunard and the ship designers, witnesses were pressured to report two torpedoes. An example of concealment was the withholding of information about the ammunition cargo that the ship carried. Explosive cargo might have been identified as a reason for the rapid sinking. Photo from the George Grantham Bain Collection (U.S. Library of Congress). Following unwanted outcomes, we often commission "lessons learned" exercises to investigate the conditions that brought about the unwanted outcomes. We want to learn how to prevent recurrences of those outcomes or any other unwanted outcomes that might flow from similar conditions. In too many organizations, these exercises yield useless or misleading results. What we seek is Truth: the reasons why the unwanted outcome occurred. But these investigations rely on reports from people who participated in or witnessed events leading to the outcome. To find the truth we must interpret the reports we receive, and those reports can contain a variety of misleading elements. Here's a short catalog of those elements. Relying on memory and impressions, witnesses and participants sometimes get it wrong. They get confused about the order of events, or who did what. They confuse what they actually witnessed with what they heard about second-hand. An excuse is a fact, condition, or situation that provides protection for someone from blame for the unwanted outcome. Excuses are those offerings that, if true, most people would accept as relieving someone of being regarded as having caused or contributed to causing the unwanted outcome. An allegation is the opposite of an excuse — it's a fact, condition, or situation that, if true, affixes to someone blame for the unwanted outcome. While excuses tend to be offered by the person excused, allegations tend to be offered by someone other than the one blamed. Reports that omit relevant information can also mislead investigators. Omissions can be intentional, but they need not be. They can result from numerous factors including faulty memory, emotional trauma, and poor technique by the investigator. misleading elementstranscends intentional omission. It includes deliberate actions to deflect the investigator from the information concealed, such as destruction or obfuscation of information, or propagating false accounts of events. It can also include actions that make the information difficult to retrieve. For example, important witnesses might be relocated, terminated, or transferred. Fabrications are fictions intended to mislead the investigator. When well crafted and when delivered by someone who is unaware that they are fabrications, they are difficult to detect, because the deliverer isn't actually lying. Detecting them often requires tracing them to their source. In determining who acted (or did not act) so as to contribute to the genesis of the unwanted outcome, there's a high risk that some witnesses and participants might experience the investigation as a search for someone to blame. The investigators themselves might adopt this belief. For indicators that an organizational culture is a blaming culture, see "Top Ten Signs of a Blaming Culture," Point Lookout for February 16, 2005. The words blame and accountability are often used interchangeably, but they have very different meanings. See "Is It Blame or Is It Accountability?," Point Lookout for December 21, 2005, for a discussion of blame and accountability. For more on blaming and blaming organizations, see "Organizational Coping Patterns" and "Plenty of Blame to Go Around," Point Lookout for August 27, 2003. Would you like to see your comments posted here? rbrenfAgvxPmBhLqUMvGNner@ChacFgNFAFmYgpmgynozoCanyon.comSend me your comments by email, or by Web form. I offer email and telephone coaching at both corporate and individual rates. Contact Rick for details at rbrendGtKjlJZZjhnubfpner@ChacunereVHPJfAFsPIToCanyon.com or (650) 787-6475, or toll-free in the continental US at (866) 378-5470.